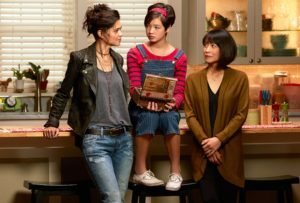 Andi Mack, a television show that features three generations of Asian American women, premiered on the Disney Channel earlier this month. The lead character “Andi” is a thirteen-year-old, mixed-race girl, who lives with her barely-middle-aged grandmother, and—spoiler alert if you haven’t watched the first episode—her mother, “Bex”, short for Rebecca, who looks and dresses, as if she could be in her early thirties. The premiere of Andi Mack is noteworthy because Asian Americans in mainstream American entertainment are so rare. When they do appear, Asian Americans are usually “white-washed,” replaced by white actors or actors of mixed-ethnicity, most recently in ‘Doctor Strange,’ and ‘Ghost in the Shell.‘ In the few American films where there are Asian American protagonists, like “Better Luck Tomorrow,” “21 and Over,” and “Harold and Kumar Go to White Castle,”Asian American women are veritably absent and silent; they exist to develop men’s characters. Click here for full post.